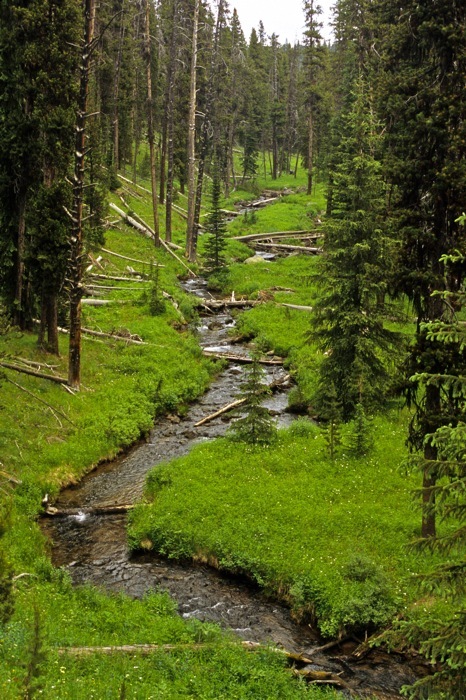 The northwest corner of Yellowstone National Park is a little known mountain wilderness of high peaks, wide open vistas, lush woods, lots of beautiful verdant meadows, icy lakes, and clear mountain streams. In short, backpacking trips in Yellowstone Park are breathtakingly beautiful. Big populations of elk, deer, moose, bighorn sheep, mountain goat, plus black and grizzly bear thrive here, and opportunities to view wildlife are excellent. Mid-summer wildflower blooms are spectacular. Although our route traverses mountainous terrain that thrusts into alpine vastness, the trail gradients are moderate. We rate this trip moderate and its base is in Bozeman, Montana. We have a number of backpacking/hiking routes to choose from here in the far northwest corner of Yellowstone. 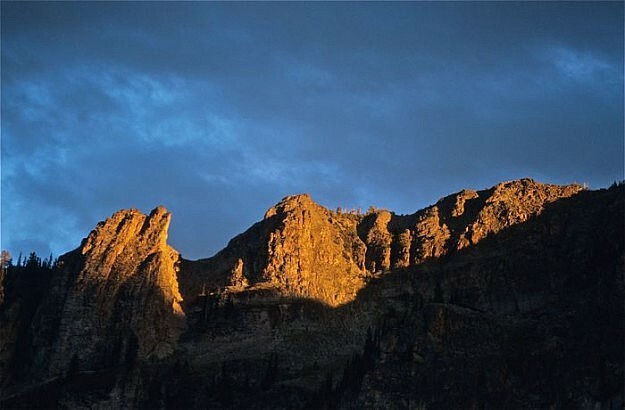 Depending upon the exact route, some of the place names include Specimen Creek, High Lake, Sportsman’s Lake, Electric Pass, Bighorn Peak, Crescent Lake and more. This Yellowstone guided backpacking trek is either a “lollipop loop” or a loop that ends a few miles from the trail head where the trip begins. TREK BASE: Bozeman, MT. Comfort Inn, 1370 N. 7th Avenue, 59715; (406)587-2322. Motel has airport pickup. Meet in lobby. MEETING TIME: Pre-trip orientation plus food & gear handout and safety talk at 6 PM the evening prior to the first day of the trip. For example, if the trip is the 23rd-28th, we meet at 6 PM on the 22nd at the Comfort Inn. TRANSPORTATION: Air service to Bozeman. Alternative: fly to Billings and rent car or take bus to Bozeman (a 2 hour ride on Interstate 90). TREK RATING: Moderate, mostly on good trails with modest gradients. The longest backpacking day is about 8 miles; there will be at least one layover. ELEVATIONS: 7,000-9,500 feet, with optional higher day-hikes. Maximum one-day elevation gain with backpack is about 1500 feet. WEATHER: Typically, lots of sunshine with 70 degree afternoons & cool nights. Brief thunderstorms are common; prolonged summer rains are unusual. Clear nights can be frosty, and in the high country snow can fall any time. Click here for National Weather Service forecast for the area. FISHING: Stream fishing is good at the lower elevations, and depending upon our exact route, we may visit a fishy lake or two. Please inform us if you plan to fish, and you must obtain a Yellowstone fishing license in Bozeman. 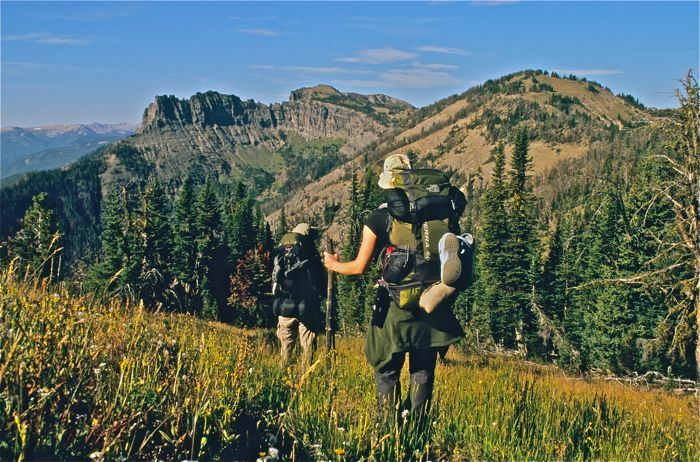 SPECIAL FEATURES: A true high mountain Montana, Yellowstone backpacking trip featuring vast open snow-flecked sub-alpine and alpine meadows. High peaks and dense forests. 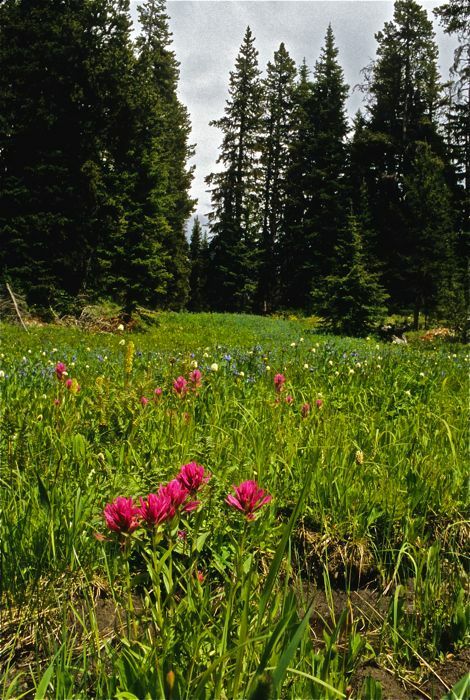 Great vistas and spectacular mid-summer wildflower blooms. The high Rockies at their best on relatively mellow trails! Wildlife is abundant, with potential opportunities to view moose, elk, bighorn sheep, wolves, grizzlies & more! 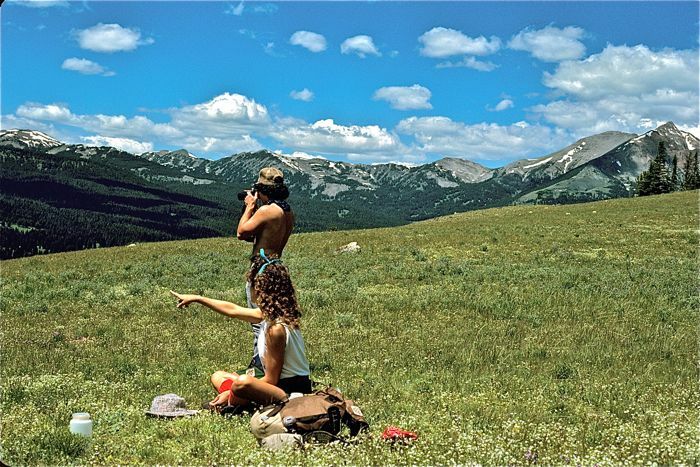 With all this trip has to offer, we are confident you will love hiking in Yellowstone National Park with us! STATUS: The Yellowstone backcountry should be designated Wilderness by Congress, but meanwhile, this area is not threatened by imminent development. ITINERARY: This is usually a loop trip. Trail-heads are about an hour or so from Bozeman, and we usually run the trip from trail-heads in the Gallatin Canyon, on the west side of the range. Campsites are reserved in advance exclusively for our group. 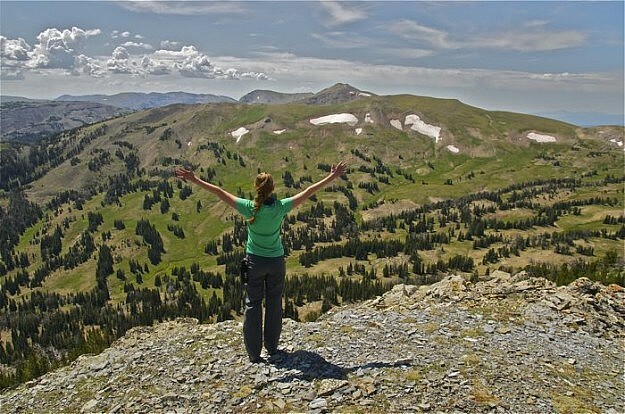 Return to the main Yellowstone backpacking trips page to view other related Montana guided tours. Please note: Because we vary the route depending upon conditions of the year and other factors, mileages and elevations are approximate.